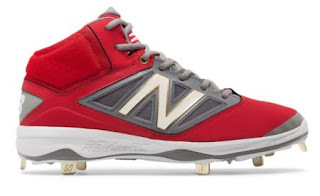 Today ONLY (2/5) these Men's New Balance Mid-Cut 4040v3 Metal Baseball Cleat $34.99 (Retail $99.99). Find your power with Drive Zone foot-to-field plate inside the toe of the 4040v3, a fresh new scientific approach to baseball cleat design through underfoot data collection from some of the game's best. So others can play catch-up to you.